Thunderstorms will continue Thursday from the Ozarks into the Ohio Valley ahead of a cold front. These thunderstorms will have the potential to produce excessive rainfall. A developing area of low pressure will bring freezing rain and snow to the Central Plains and Midwest. 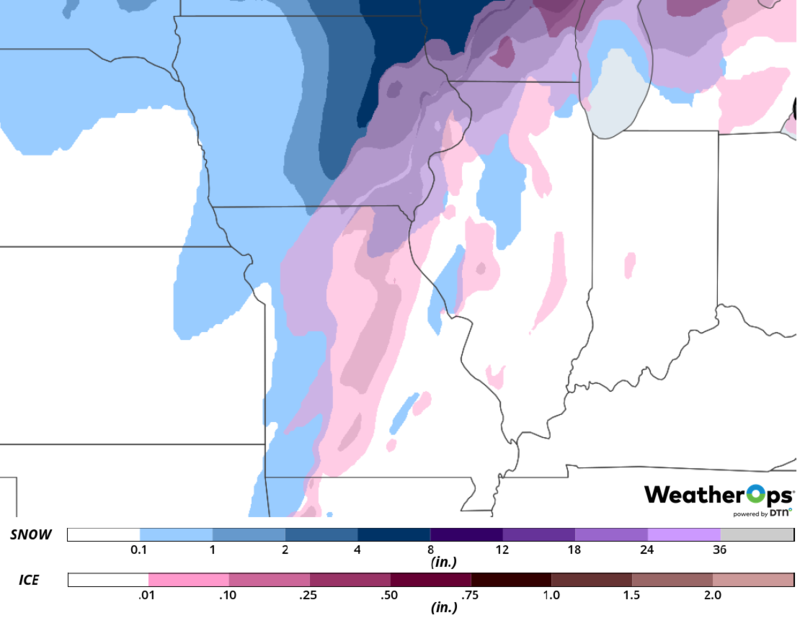 Moderate to heavy snow will continue across the Upper Midwest. Dense fog will persist along the Gulf Coast through Thursday afternoon. Elevated winds and seas are expected across the Gulf of Mexico through Sunday morning as a cold front moves eastward. Thunderstorms will continue from the Ozarks into the Ohio Valley as an area of low pressure and associated cold front continue to move eastward. With warmer temperatures ahead of the front and cool mid-level temperatures, increased instability is expected ahead of the front. This will support the development of thunderstorms. 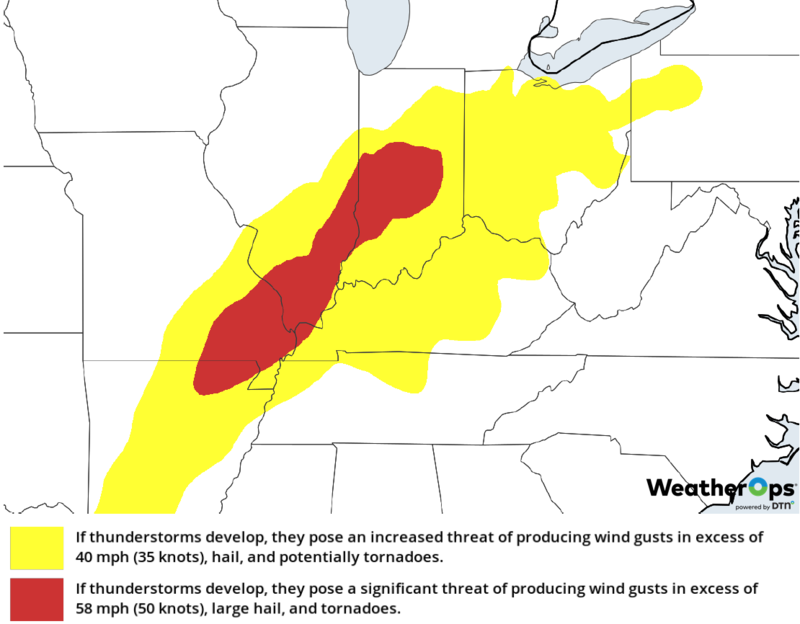 Strong winds and hail will be the primary hazards, but an isolated tornado or two cannot be ruled out. In addition to the thunderstorms described above, there will be a potential for excessive rainfall. While rainfall amounts will only be around an inch, ground that is already saturated may allow for some minor flooding and local runoff. An area of low pressure developing over the Plains is lifting to the northeast across the Central Plains and Midwest, bringing wintry precipitation to the region. Across portions of Missouri, southeastern Iowa, northern Illinois, and southeastern Wisconsin, warmer temperatures aloft will lead to freezing rain throughout the region. Ice accumulations between 0.10-025 inch are forecast. To the west and north, snow is expected; accumulations will range 4-6 inches of snowfall with locally higher amounts in excess of 8 inches across northern Iowa. Gusty winds will pose a potential for power outages in areas receiving freezing rain. Moderate to heavy snow will continue across the Upper Midwest as an area of low pressure moves north-northeastward. 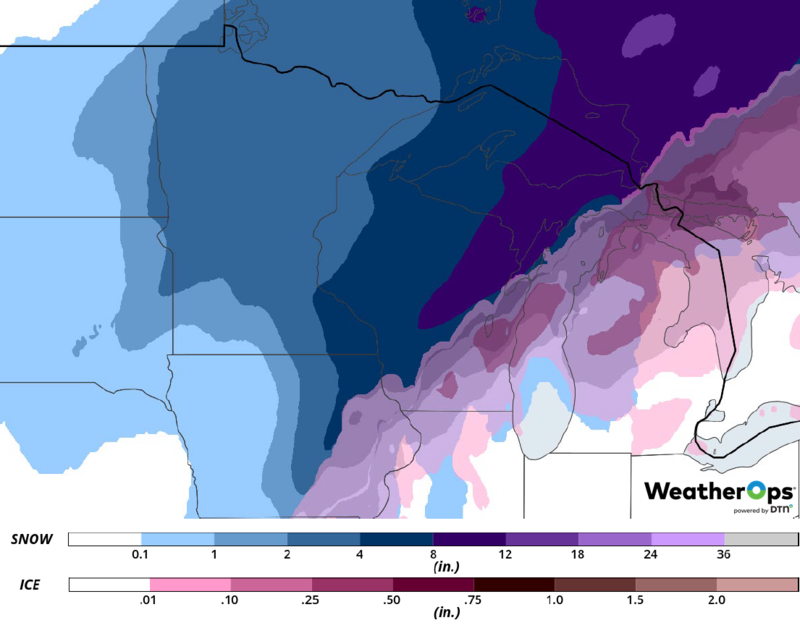 Snow accumulations will range 4-8 inches with the heaviest snow across Wisconsin. Freezing rain accumulations of 0.10-0.25 inch are forecast, especially across southeastern Wisconsin and parts of Michigan, as temperatures aloft remain above freezing. Increased wind gusts are expected, leading to power outages, mainly in areas receiving accumulating freezing rain. Light winds will allow dense fog to persist along the Texas and Louisiana coasts through the afternoon. Visibilities will fall below a quarter mile at times. The fog should dissipate late in the afternoon as a cold front pushes off the coast. A cold front moving across the Gulf of Mexico will produce elevated winds and seas through Sunday morning. Ahead of the front, winds will be south-southeasterly at 5-10 knots. 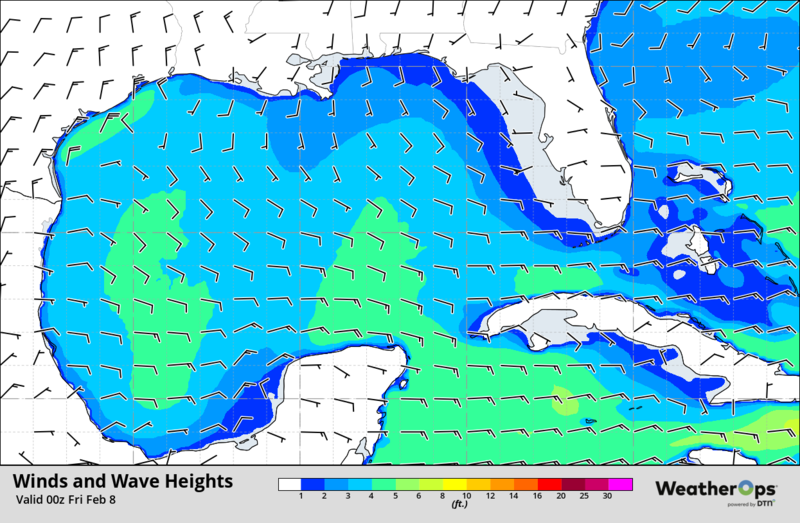 Behind the front, winds will be northeasterly at 25-30 knots with gusts in excess of 40 knots. In western areas, seas will range 5-8 feet near the shore and 11-14 feet in the deeper waters. Further east, seas will range 7-10 feet. 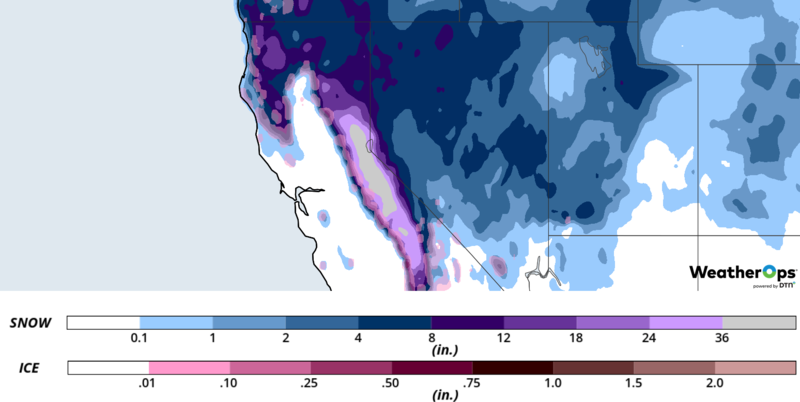 An area of low pressure currently off the Pacific coast is forecast to bring significant snowfall to the Sierra Nevadas this weekend. Snowfall totals will range 18-24 inches with locally higher amounts below 7,000 feet. Above 7,000 feet, accumulations of 24-36 inches with locally higher amounts are expected. In addition, wind gusts in excess of 40 mph in lower elevations and 60 mph in higher elevations will produce blowing snow and visibilities less than a quarter mile at times. Snow is expected across the Plains on Sunday as an area of low pressure moves eastward. Another round of snow may develop across the Northern Plains on Monday. Showers and thunderstorms are forecast from the Ohio Valley into the Southeast ahead of a cold front. As an area of low pressure moves across the Plains on Tuesday, snow may extend from the Plains into the Great Lakes. Light snow may linger across the Great Lakes into Wednesday.